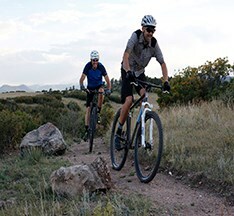 The 7.4-mile, native-surface trail network consists of singletrack trails divided into four different, but interconnected, loops with 1.2 miles of paved accessible segments in the active park area near the Miller Activity Complex, the MAC. The trails explore all the valleys, knolls and high points of this 270-acre site. A unique feature on the site is the Challenge Staircase, with 200 steps that climb 178 feet in elevation, similar to the Manitou Springs Incline. Bikes are not recommended on the challenge staircase. For the official website, click here. For a trails map, click here. Park at the north side of the complex for closest access to the bike trails. This trail was added on by an RMBB member and was last updated on 11/20/2015 by an RMBB member.